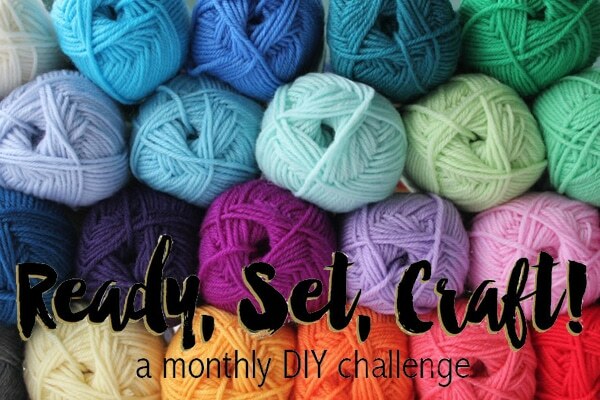 The January Ready, Set, Craft! challenge item was YARN. As one of the co-hosts of the monthly challenge, it was my turn to choose the item. I have a big bag of yarn remnants I’ve had for years from my grandma so I decided to try to use those for something (finally!). Someday I’d like to learn to knit or crochet. I tried crochet when I was younger but was never very good at it. I have a simple DIY anyone can do: yarn pom poms! You can use these little yarn pom poms for so many different things: a cute banner, a mobile, trim on curtains or pillows, etc. For this month’s project I used them to make a knock off Anthropologie wreath. This wreath retailed for over $100 – mine was FREE. Even if you had to buy the supplies, it should cost less than $10 to make. I sat and made the yarn pom poms while watching The Mindy Project during the holidays. I have a simple DIY anyone can do: yarn pom poms! You can use these little yarn pom poms for so many different things: a cute banner, a mobile, trim on curtains or pillows, etc. Hold the end of the yarn between your ring finger and thumb. Then start wrapping. Keep wrapping until you have a good amount on your fingers. The more you wrap, the fuller the yarn pom poms will be. Snip the end of the yarn from the spool and pull up the piece of yarn that's been resting between your fingers. Gently slip the yarn ball off your fingers and pull the small piece of yarn tightly to knot it. I double knot here. Holding the ball in the middle, slip the end of the scissors through the loop the yarn made and cut the edges. You now have a yarn pom pom! You can trim it or leave it crazy like I did. I made about 30 yarn pom poms for my Happy New Year wreath, but may go back and add a few more so it’s even fuller. After wrapping the wreath form with fabric, I used straight pins to attach the yarn pom poms to the wreath. You could also use a hot glue gun, but I wanted something less permanent and the pins held the poms in place just fine. The yarn pom poms reminded me of fireworks so I added a Happy New Year banner I cut out with my Silhouette machine.